Download "The alternative should not be inferior"
2 Maggie Kalnins is Chief Executive of Inclusion Trust. Throughout her 25 year career in secondary teaching and headship, Maggie worked within urban multi-racial communities serving the most deprived and disadvantaged. 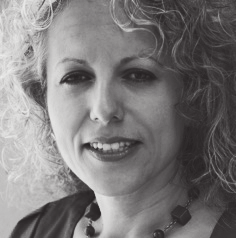 She has a strong understanding of the distinctive challenges that many young people face. 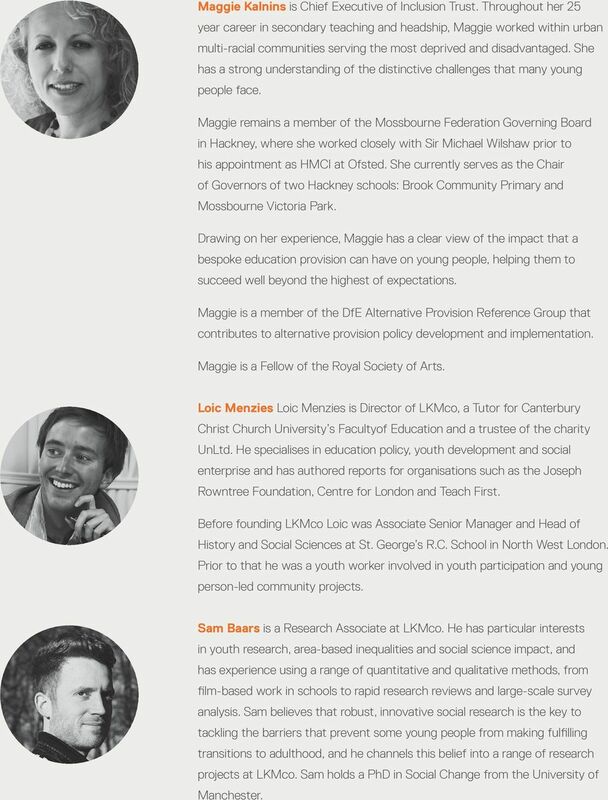 Maggie remains a member of the Mossbourne Federation Governing Board in Hackney, where she worked closely with Sir Michael Wilshaw prior to his appointment as HMCI at Ofsted. She currently serves as the Chair of Governors of two Hackney schools: Brook Community Primary and Mossbourne Victoria Park. Drawing on her experience, Maggie has a clear view of the impact that a bespoke education provision can have on young people, helping them to succeed well beyond the highest of expectations. Maggie is a member of the DfE Alternative Provision Reference Group that contributes to alternative provision policy development and implementation. Maggie is a Fellow of the Royal Society of Arts. Loic Menzies Loic Menzies is Director of LKMco, a Tutor for Canterbury Christ Church University s Facultyof Education and a trustee of the charity UnLtd. He specialises in education policy, youth development and social enterprise and has authored reports for organisations such as the Joseph Rowntree Foundation, Centre for London and Teach First. 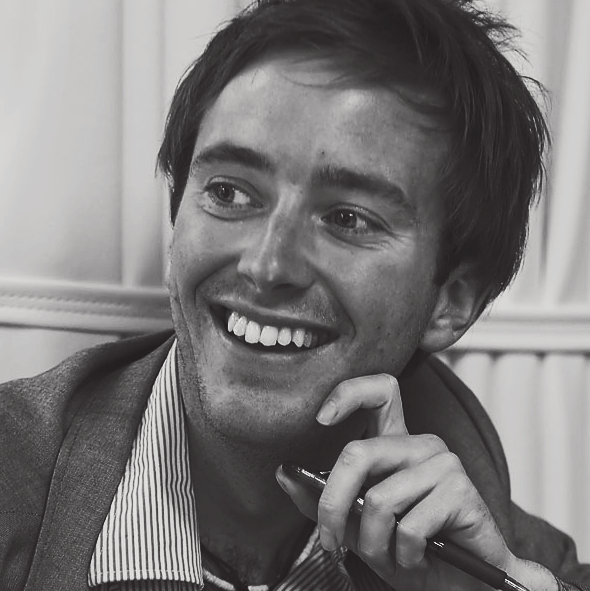 Before founding LKMco Loic was Associate Senior Manager and Head of History and Social Sciences at St. George s R.C. School in North West London. Prior to that he was a youth worker involved in youth participation and young person-led community projects. Sam Baars is a Research Associate at LKMco. He has particular interests in youth research, area-based inequalities and social science impact, and has experience using a range of quantitative and qualitative methods, from film-based work in schools to rapid research reviews and large-scale survey analysis. Sam believes that robust, innovative social research is the key to tackling the barriers that prevent some young people from making fulfilling transitions to adulthood, and he channels this belief into a range of research projects at LKMco. 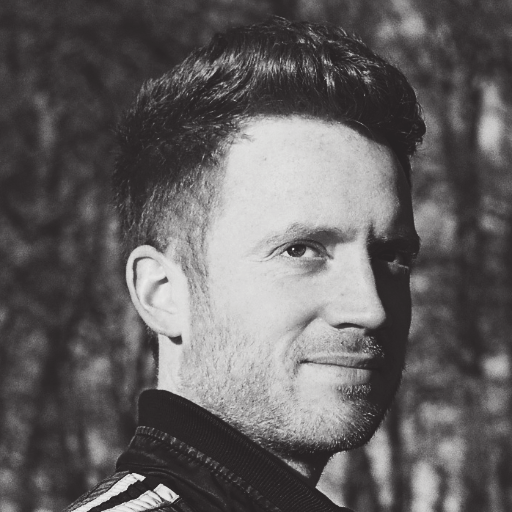 Sam holds a PhD in Social Change from the University of Manchester. 3 This report is the outcome of a roundtable debate involving fourteen sector experts as well as three additional interviews. It draws together participants perspectives and sets out a series of tensions as well as areas of common agreement. 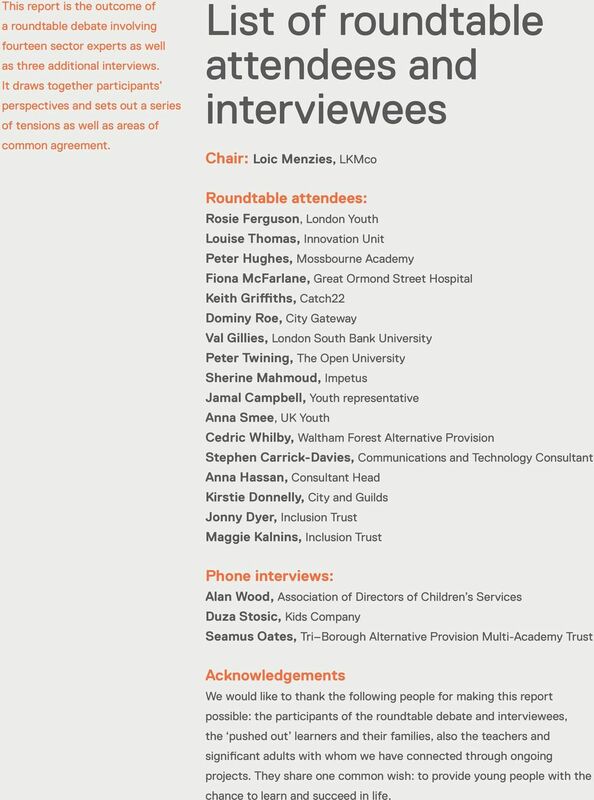 List of roundtable attendees and interviewees Chair: Loic Menzies, LKMco Roundtable attendees: Rosie Ferguson, London Youth Louise Thomas, Innovation Unit Peter Hughes, Mossbourne Academy Fiona McFarlane, Great Ormond Street Hospital Keith Griffiths, Catch22 Dominy Roe, City Gateway Val Gillies, London South Bank University Peter Twining, The Open University Sherine Mahmoud, Impetus Jamal Campbell, Youth representative Anna Smee, UK Youth Cedric Whilby, Waltham Forest Alternative Provision Stephen Carrick-Davies, Communications and Technology Consultant Anna Hassan, Consultant Head Kirstie Donnelly, City and Guilds Jonny Dyer, Inclusion Trust Maggie Kalnins, Inclusion Trust Phone interviews: Alan Wood, Association of Directors of Children s Services Duza Stosic, Kids Company Seamus Oates, Tri Borough Alternative Provision Multi-Academy Trust Acknowledgements We would like to thank the following people for making this report possible: the participants of the roundtable debate and interviewees, the pushed out learners and their families, also the teachers and significant adults with whom we have connected through ongoing projects. They share one common wish: to provide young people with the chance to learn and succeed in life. 12 Part 2 Who are these pushed out learners? 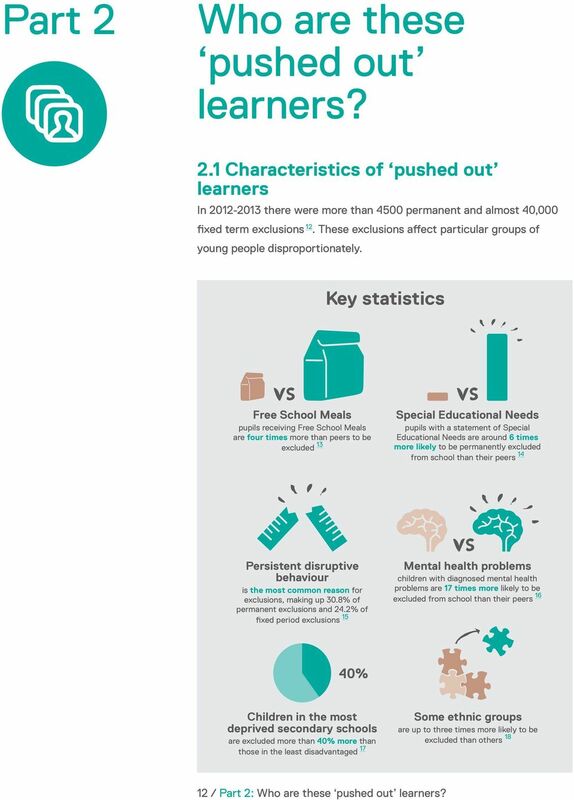 2.1 Characteristics of pushed out learners In there were more than 4500 permanent and almost 40,000 fixed term exclusions 12. These exclusions affect particular groups of young people disproportionately. Key statistics Free School Meals pupils receiving Free School Meals are four times more than peers to be excluded 13 Special Educational Needs pupils with a statement of Special Educational Needs are around 6 times more likely to be permanently excluded from school than their peers 14 Persistent disruptive behaviour is the most common reason for exclusions, making up 30.8% of permanent exclusions and 24.2% of fixed period exclusions 15 Mental health problems children with diagnosed mental health problems are 17 times more likely to be excluded from school than their peers 16 40% Children in the most deprived secondary schools are excluded more than 40% more than those in the least disadvantaged 17 Some ethnic groups are up to three times more likely to be excluded than others / Part 2: Who are these pushed out learners? 13 These figures highlight the scale of the challenge we face, but we do not use the term pushed out learners purely to refer to formally excluded young people. For example, these figures do not take into account young people who Griffiths describes as wallpaper young people : Keith Griffiths, Catch22 The other young people we re currently working with are what we ve called wallpaper young people. So they re the young people that turn up but then just sit at the background and disengage. Pushed out learners may fall into any number of categories, whether in-care, with special needs or in poverty, but these, and any other label attached to them, matter less than the common factors that act as a barrier to their inclusion. The experts we spoke to emphasised that certain key pieces are missing for some young people and that these stopped them accessing the educational norm. As the experts we spoke to (who were in some cases uncomfortable with the term pushed out ) argued, learners are rarely pushed out because schools do not want to help them; more often it is because these young people s needs are so far outside the norm that schools in their current form are not equipped to support them. 2.2 A gap in basic needs If young people or their families are hungry and endangered these immediate needs act as barriers to access. We cannot expect learners with gaps at the bottom of Maslow s hierarchy of needs 19 to be ready to access education. Duza Stosic, Education Director, Kids Company If they don t have anywhere to sleep, if they don t have beds at home, if they don t have food how can you expect them to achieve academically? Recent reports have shown that schools are increasingly having to cater for these needs before their pupils can even begin to access learning 20. Schools therefore need to work closely with social services to ensure that the basic needs of pupils at risk of becoming pushed out learners are being met. 13 / Part 2: Who are these pushed out learners? 14 2.3 A gap in socialisation Functioning in a school requires the ability to negotiate basic interactions - for example to walk from one room to another through a thousand other people or to be able to sit in a room quietly with other people. There is nothing wrong with this being the expectation, but young people who arrive at school unable to do so will inevitably find adjusting to school harder. 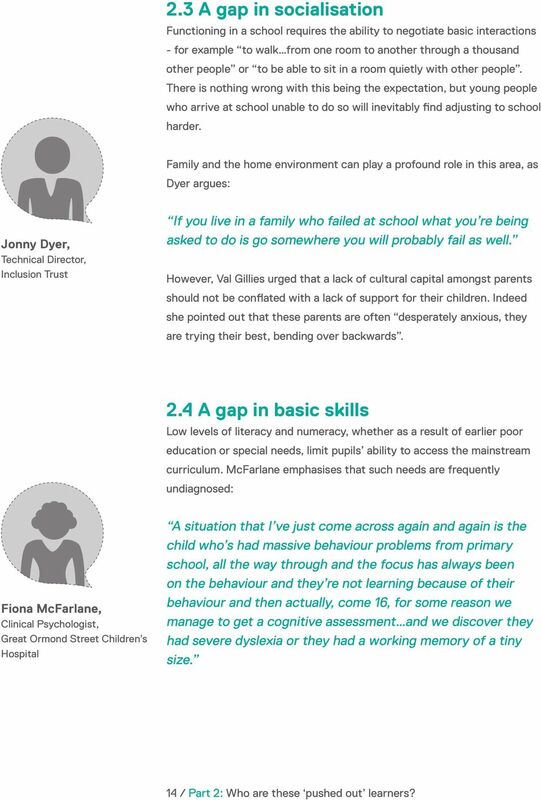 Family and the home environment can play a profound role in this area, as Dyer argues: Jonny Dyer, Technical Director, Inclusion Trust If you live in a family who failed at school what you re being asked to do is go somewhere you will probably fail as well. However, Val Gillies urged that a lack of cultural capital amongst parents should not be conflated with a lack of support for their children. Indeed she pointed out that these parents are often desperately anxious, they are trying their best, bending over backwards. 2.4 A gap in basic skills Low levels of literacy and numeracy, whether as a result of earlier poor education or special needs, limit pupils ability to access the mainstream curriculum. McFarlane emphasises that such needs are frequently undiagnosed: Fiona McFarlane, Clinical Psychologist, Great Ormond Street Children s Hospital A situation that I ve just come across again and again is the child who s had massive behaviour problems from primary school, all the way through and the focus has always been on the behaviour and they re not learning because of their behaviour and then actually, come 16, for some reason we manage to get a cognitive assessment and we discover they had severe dyslexia or they had a working memory of a tiny size. 14 / Part 2: Who are these pushed out learners? 15 2.5 Institutional practices Organising large schools involves certain institutional practices that some young people struggle to cope with: Anna Smee, Chief Executive, UK Youth State schools in particular are relatively large organisations, with large classes and they have to cater for the majority. If you have complex needs and/or you re of a personality that is typically thinking differently to the norm, or doesn t want to conform then where do you go? Overall, it is inevitable (and positive) that there is huge diversity amongst the pupil population but there is a limit to how much variation from the norm mainstream schools in their current form can manage. 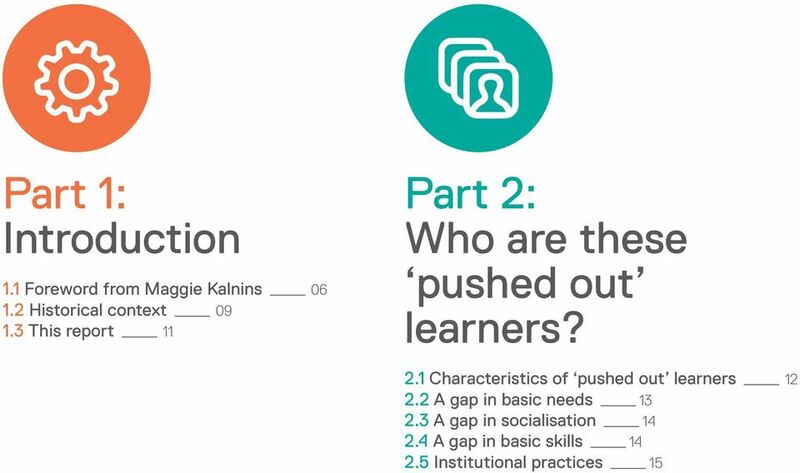 We therefore explore three approaches to supporting pushed out learners: 1. Bringing pushed out learners into the mainstream structure 2. Innovating within the mainstream structure 3. Working outside of the mainstream structure 15 / Part 2: Who are these pushed out learners? 25 Part 4 What now for pushed out learners? 1. Bringing pushed out learners into the mainstream structure 2. Innovating within the mainstream structure 3. Working outside of the mainstream structure Conclusion Young people have a right to education but schools in their current form do not provide this for everyone. The young people we describe as pushed out learners are characterised by their struggles in adjusting to school, their vulnerability due to personal or family circumstances and the gaps they have in their basic needs and skills. 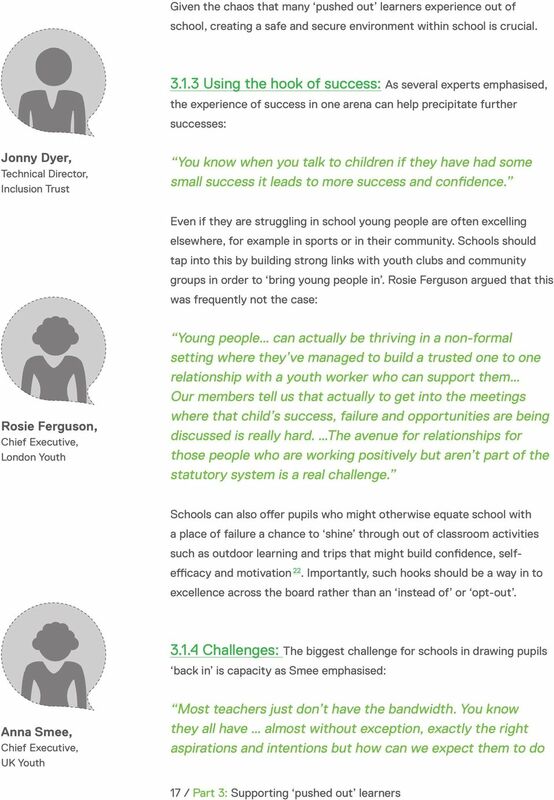 The experts we spoke to had different views on whether these young people needed more support to adjust to school, whether school should adjust to their needs or whether they should be supported elsewhere. Positions often depended on beliefs about whether schools priority should be a vulnerable minority or the broader majority. The three models presented in this report are not mutually exclusive and are right for different pupils depending on their needs. For example, where pupils face a specific barrier to access such as poor literacy or a lack of social skills, they might be supported to learn these and brought into the mainstream. Meanwhile adjustments to the way a school works (perhaps by offering a broader range of pathways) may suit other pupils. On the other hand, for some young people who are unwilling, unable or unsuited to the norm, provision outside of the mainstream may result in the best outcomes. Such provision might be temporary or permanent; full time or part time. Ultimately it is only by engaging with the pupils needs that the right approach can be found. We believe that the best approach to supporting pushed out learners brings together these three different approaches, showing flexibility by deploying the approach that best meets the needs of each young person. 25 / Part 4: What now for pushed out learners? 26 Recommendations Bring pushed out learners into the mainstream structure 1. 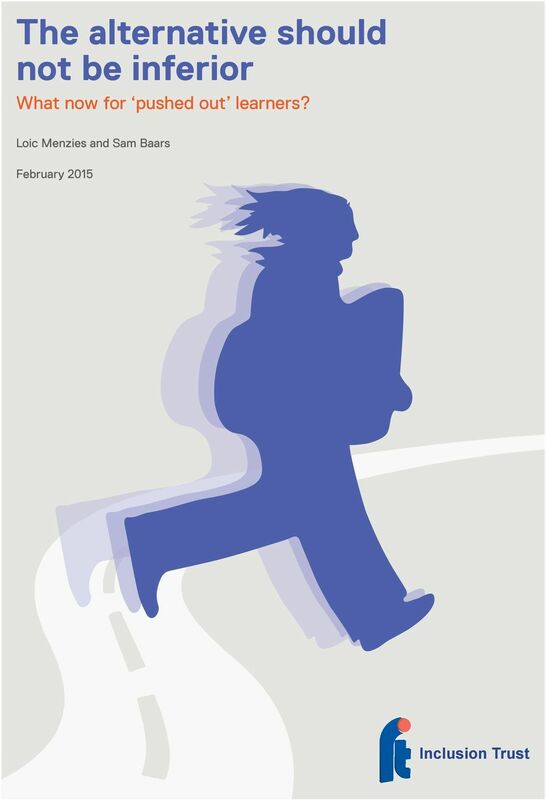 Schools should ensure that pupils basic needs are met by working more closely with social and mental health services. 2. Rather than focusing solely on those eligible for the pupil premium or with identified special needs, schools should be sensitive to the full range of factors that might lead to a pupil becoming a pushed out learner. 3. Too often it takes the drastic step of exclusion to secure the resources and support that a pushed out learner needs. Local authorities should be proactive rather than reactive in brokering support and funding. 4. It is easier to focus on pupil needs in a safe, secure environment. Establishing this should be a top priority in all schools and be seen as a route to inclusion. Innovate within the mainstream structure 5. Pupils who are likely to find it difficult to adjust to the school environment should be carefully supported for example through nurture groups with lower pupil-teacher ratios. These groups should be staffed by the schools best teachers and should combine a focus on basic literacy and numeracy skills, core academic subjects and social, emotional and behaviour development. They should be highly responsive to pupils needs and prepare them to transition into the mainstream. 6. Schools should embrace opportunities to hook in pushed out learners through innovative outside-school and extra-curricula activities that appeal to the passions and interests of the learners. These should be ways in rather than alternatives and the emphasis should be on excellence whether in debating, sport, art or real-world learning. 26 / Part 4: What now for pushed out learners? 27 Work outside of the mainstream structure 7. All schools should develop strong relationships with alternative providers and share, rather than shift responsibility for the pupils they are unable to support. This could happen either through commissioning and accountability arrangements or by building school clusters, for example through federations and multi-academy trusts. 8. Alternative providers should not overlook achievement in their pursuit of engagement. High expectations should be the norm. 9. Alternative providers should be recognised as partners in delivery and valuable sources of expertise rather than a necessary evil. 27 / Part 4: What now for pushed out learners? of Scotland s looked after children & young people. ambition [noun] a desire and determination to achieve success. Schools for All. Schools for All. Including disabled children in education. Including disabled children in education. guidelines. What do people want, need and expect from public services?